64 Bit version for handling high megapixel raw files. Takes advantage of Windows 64 Bit OS's. RAWHide outputs the best quality 16 bit per channel Tiff files with full EXIF data. Thumbnailer allows fast previews of directories of RAW files using large thumbnail images. RAWHide/Thumbnailer combo is designed for Dual Screen Operations. ALL available and recoverable highlight data is extracted and saved in the output tiff image. Dark frame subtraction available at the raw image level. (Raw data is subtracted from raw data). Flat Frame correction available at the raw image level. Simple but effective Noise Reduction that does not kill real image detail. Six Demosaicing routines available to best suit your image! ACC Demosaicing routine faithfully extracts and recovers all of the resolution and detail possible. ECW Demosaicing routine produces a fine "film-like" grain and a "natural" image quality. 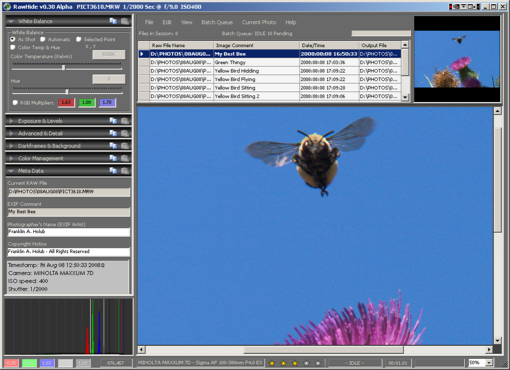 Simple “Control – Double Click” to select White Balance. Simple “Alt – Double Click” to select Background Subtraction. Uses the Sony Alpha Mount Lens ID to report the lens description for the lens used to take the photo from an editable lens database. Reads the Zone Matching tag and adjusts the image per the intent of ZM. “Sidecar” database files remember your conversion settings for each raw file. Drag-N-Drop and file clipboard support. Unique “f/Stop” histogram. Displays histogram in photographic terms (stops). Cut and Paste image settings (ie, White Balance, etc) from one image to another. RAWHide uses the KM 7D/5D rotation tag to correctly rotate the output tiff image. Simple Color Management control with automatic multi-screen support. Modify or Change RAW data or files. Employ detail killing noise reduction. Sacrifice of Output Quality for... Anything!